NOW WITH MORE! 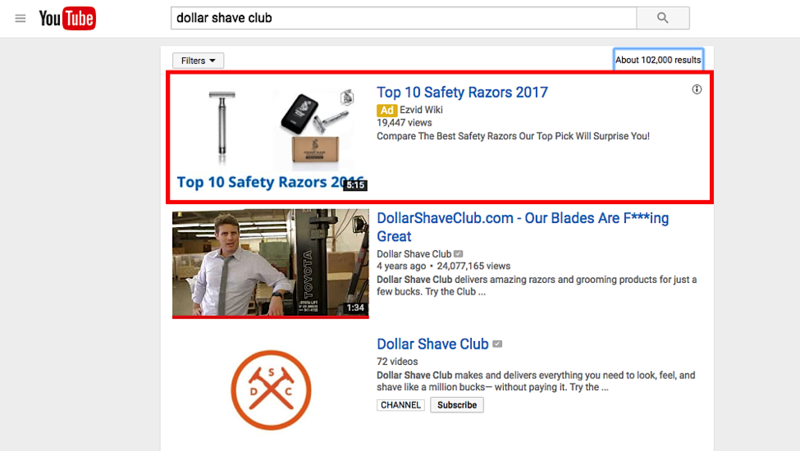 This post about building a successful YouTube ad campaign was updated for 2018 to reflect new information! By 2019, 80% of traffic on the Internet will come through video. That’s a tremendous amount of traffic—which you can tap into in order to help promote your brand. To date, some of the largest brands, including Progressive, Facebook and Google Earth, have invested heavily in video marketing campaigns on YouTube. Even smaller brands can leverage the power of this video network, though they’ll need to set clear goals and develop an organized approach to construct campaigns that result in a positive ROI. YouTube conversions consistently outperform those on other social networking sites: the average conversion rate on YouTube is 14%, whereas it’s just 10% on Facebook. YouTube video ads are incredibly cost-effective when it comes to generating traffic. 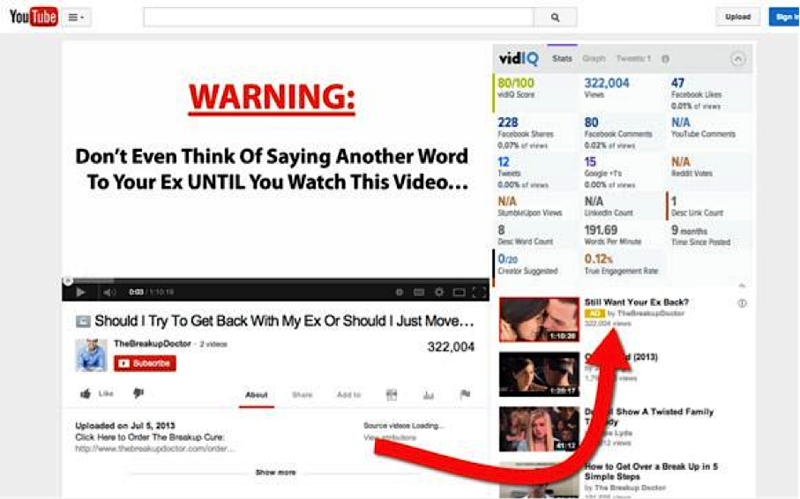 Learn More: Are You Exploiting YouTube’s Cheap Advertising Platform Yet? Cheap traffic that converts so well? You’re probably wondering what the catch is. Here’s the catch: it takes time to create quality videos and optimize an ad campaign that converts. But if you’re willing to make the investment, the results can be impressive. You’ll need to sign into YouTube before you can create an account. And since YouTube is part of Google, you can log on with your standard personal or business Google account. Click on the tab that reads “All My Channels.” If you’re having difficulty finding it on your profile page, this link will take you there. 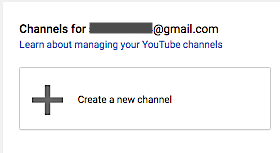 Next, you’ll see a dialogue box that reads “Create a New Channel.” Click that button to create your YouTube channel, and choose a name that’s both relevant to your brand and appealing to your users. Then select the category that your channel falls under. You can choose to create either a channel for a brand/product or for your company as a whole. Remember, you can always create multiple channels. Depending on your company’s organization and size, it may be worth creating one for your brand and others for your core products. However, most small brands will find it easier to simply create a single channel for their entire business. Before you accept YouTube’s terms and conditions and click the “Create” button, take some time to really think about your chosen name and category. Think about how the title of your channel will affect both your branding strategy and your SEO rankings. For these reasons, it may be a good idea to include relevant keywords in your title (such as your industry and the region that you operate in), but it’s even more important to include your brand name, since that is what people will be searching for and associate with your channel. Don’t get too caught up on SEO, though, as there are other ways that you can improve your channel’s ranking, such as including important keywords in your channel and video descriptions. But more on that later…. Free Bonus Download: Get our YouTube Ads Quick Start Guide so you can start launching profitable YouTube ad campaigns in any niche! Click here to download it free. Now you’ve successfully created your YouTube channel—but it doesn’t have any information for your viewers yet. Before anyone will want to follow it, you’ll need to provide some key details and upload some videos. Even if you don’t have any videos yet, you can at least provide a description of your channel so people will know what to expect in the future. 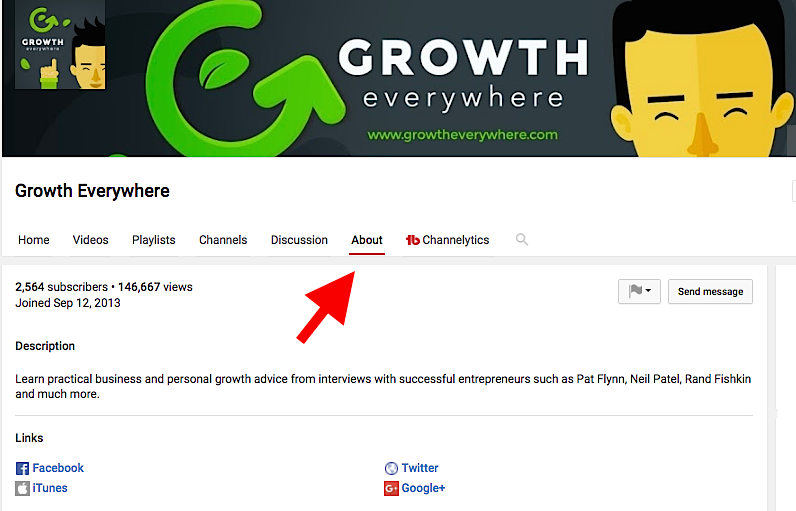 Add your description by clicking on the “About” tab on your channel page. There, you’ll need to click on the “+ Channel Description” button, which will open up a form where you can add a brief description. Make sure that the description tells your visitors about your brand, as well as the types of content that you plan to upload. For best SEO results, include some of your target keywords in the first 70 characters of your description to improve your chances of ranking for them. There’s no need to “keyword stuff” here—including them once or twice in the description is enough to help improve your rankings. These are nofollow links, so there’s no reason to use anchor-text keywords. You’re better off creating a branded link or something with a compelling call-to-action to attract visitors. YouTube will ban links that seem overly spammy, so be careful about how you structure them and how many you include. Take the time to set up your description carefully. While most people will be visiting your YouTube channel to check out your videos, your brand’s bio plays an important role in branding and driving traffic as well. This one shouldn’t come as a surprise. You’ll obviously need to create and upload some compelling videos to your channel—otherwise there wouldn’t be much point promoting your channel. That said, just because something is obvious and necessary doesn’t mean that it’s easy. This step is definitely the most time-intensive. And while a thorough explanation on how to create engaging videos is beyond the scope of this article, I do want to emphasize the importance of making sure that your videos support your brand in a positive way. And don’t feel bad as you attempt to create your own videos. 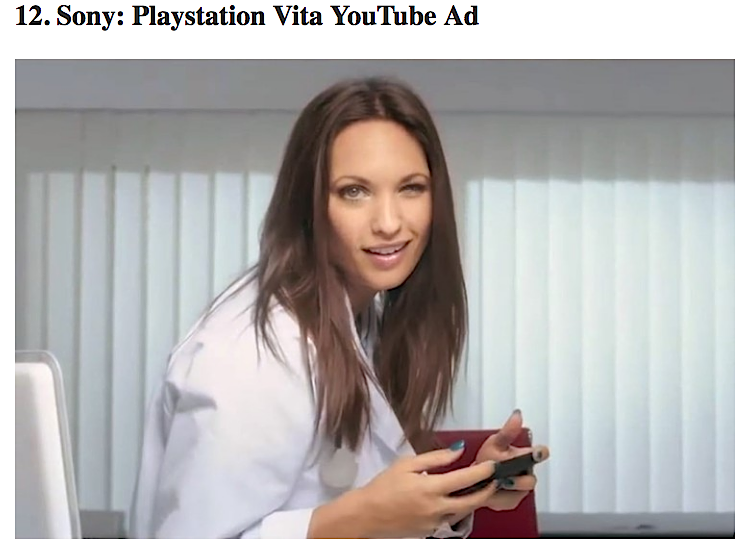 Even big brands like Sony have made some tremendous blunders when making YouTube videos! 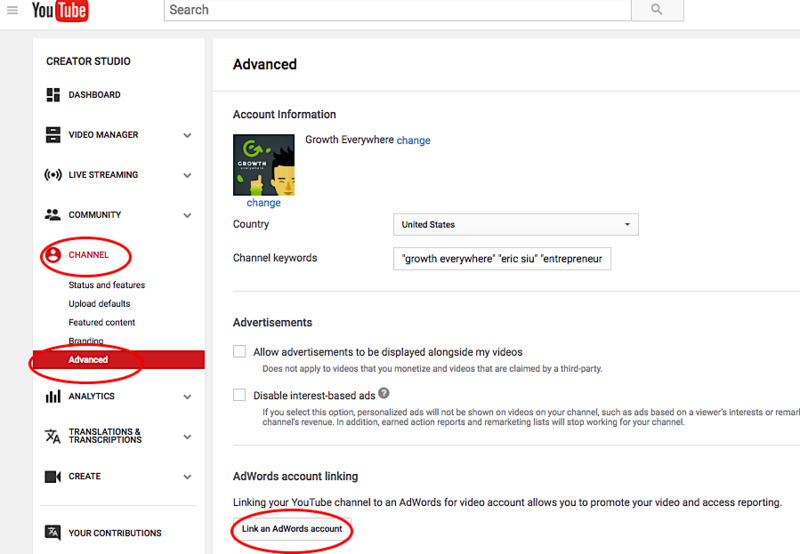 The next thing you’ll need to do is to link your AdWords account to your YouTube channel. Your YouTube channel and AdWords accounts will still remain separate entities; in other words, someone with access to the AdWords account can’t upload or delete videos unless they have access to the channel, and your YouTube channel manager can’t create AdWords campaigns. This is an important distinction to keep in mind if different people in your organization are accountable for different parts of your video marketing campaign. Click the “My Channel” tab after clicking on the channel icon. Click “Advanced” under the channel page. You will see a “Link an AdWords Account” button on the page. Click this link to finish the process. Once completed, you should receive an e-mail notification indicating that you’ve successfully linked your YouTube channel to your AdWords account. You’ll need to repeat this process for every channel that you create. Key Takeaway: Before you can launch your YouTube ad campaign, you’ll need to create a YouTube channel for your brand or product. As you do so, take the time to optimize each of the key areas listed above for both brand strategy and SEO. Now that your YouTube channel is up and running, it’s time to start creating some ads. This process is going to be fairly extensive and require a bit of testing. But the devil’s in the details, so make sure that you follow these steps carefully to get the most out of your video ads. Most AdWords users create campaigns using a CPC (cost-per-click) bidding strategy. Although you also have the option to create CPV (cost-per-view) campaigns, most people feel that CPC ads are less risky and easier to optimize. Cost Per Click (CPC) bidding means that you’ll pay for each click in your campaign. Cost Per View (CPV) bidding means that you’ll pay for video views (at least 30 seconds of the video or the entire thing if it’s less than 30 seconds) or interactions. CPV is the default setting in AdWords. Unfortunately, you can only use CPV bidding with YouTube ads, which might be a difficult shift for marketers who have run AdWords campaigns in the past. The advantage to this type of bidding is that you’ll only pay when users actually watch your video. That way, you know that you’re getting value for your money (if you can get your ads in front of the right eyes). You’ll need to decide how much you’re willing to pay before you even think about creating any ads. Remember, the CPV bid is the price you’re willing to pay every time someone watches your video. There’s a lot less wiggle room there than in CPC campaigns, which only trigger charges when a click occurs. Another important thing to keep in mind is that the bid you set isn’t necessarily the actual price you’re going to be paying per view. You’ll always be charged one penny above the second lowest price. So if you set your CPV at $0.25, but the next highest bid is $0.16, you’ll only be charged $0.17 for the view. Increasing your bid can help you get more traffic, but you’ll still need to choose bid limits that you’re comfortable with. CPVs can fluctuate significantly as other advertisers change their bids, use up their budget or change their targeting strategy. You want to set your bid high enough that you’ll generate sufficient traffic to your video, but low enough that a few shifts in your competitors’ pricing won’t deplete your budget too quickly. So what’s a good bid to set for your YouTube ads? That ultimately depends on the amount of traffic you want to generate and how tightly you’re targeting your ads.Keep in mind that AdWords allows you to create custom bids for the different groups that you want to target. Key Takeaway: When you’re setting bids, you need to make sure your CPVs are high enough to generate impressions from your target users. Creating custom bids to get impressions from different types of users may help improve your ROI. You can create the best video ads in your industry, but they won’t do you any good if you aren’t putting them in front of the right people. AdWords has some great targeting options you can use to make sure that the right people wind up watching your videos. Obviously, you want to make sure that your ads are shown on videos that are similar to your own. If you’re selling artisanal soaps, you wouldn’t want your ads appearing on sports videos (unless these two interests happen to overlap in your target audience). Choose topics that are specific to your niche, but keep in mind that it can be difficult to determine ahead of time which of these targeting options will best convert. For this reason, it’s always a good idea to test several categories that may relate to your target viewers. 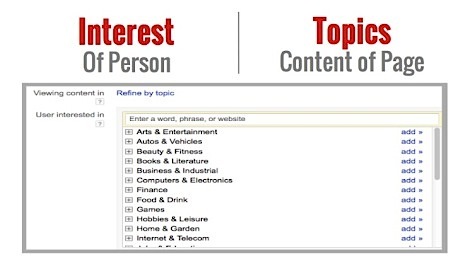 Google has recently released a new targeting option: the ability to target users based on their interests. You can target people who follow the news, are avid sports fans, enjoy working on do-it-yourself projects or have a variety of other interests. You can even select multiple interests to target a narrower audience, further improving your conversions. That said, you don’t want to choose so many interests that you don’t have a large enough user base to target with your ads. Your best bet is usually to start off with one or two interests and monitor your traffic and conversions for a little while before selecting additional interests to target. 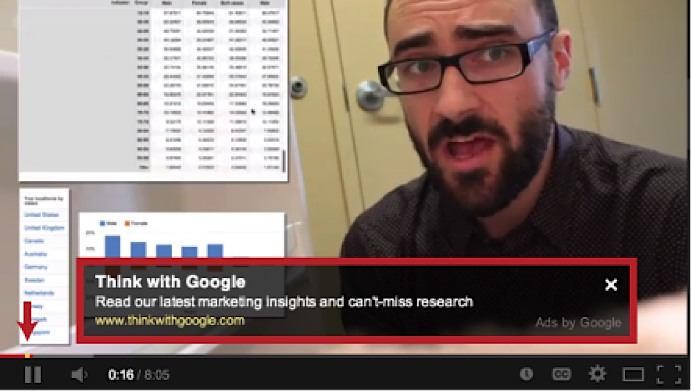 AdWords gives you the option to target specific YouTube videos. All you need to do is copy and paste the URL into the placement target. This may be a good idea if you have found some videos that are highly relevant to your campaign, though you’ll want to ensure that the videos you select have sufficient traffic to support your ads and your campaign goals. Anyone who has ever run an AdWords campaign before knows that you generally bid on the keywords that people type into the search network. And although the platform offers many other targeting options, AdWords allows you to do the same thing when setting the bidding for your YouTube ads. Use this feature to bid for certain keywords or phrases that people will type into the YouTube search bar. Your ad will only appear in exact match cases. Key Takeaway: YouTube offers a huge variety of targeting options, which you should use to their fullest potential. Identify demographics and the behavior of users who are most likely to express interest in your brand and then test how these different filtering options affect the response to your ads. After you’ve set up your targeting options and have videos that you’re ready to promote, it’s time to create your ad. Lucky for you, you’ve got a variety of options available to take advantage of. There’s no single type of YouTube ad that’s right for every campaign. A video ad can appear before the video, as the video plays or after the video, and can be skippable or non-skippable. Video Ads (formerly In-Stream Video Ads) – Video ads are advertisements that play before the user is allowed to watch a video. With them, you’re allowed to show a small banner ad next to your in-stream ads at no extra cost. Some of these ads give the viewer the option to skip and others do not. If the user is allowed to skip the ad after five seconds, the ad can be up to 60 seconds long. If the ad can’t be skipped, you’re only allowed up to 15 seconds. Overlay Ads – These ads, which are only available on YouTube’s desktop platform, measure 468×60 or 728×90 pixels and appear in a semi-transparent state over the bottom 20% of the videos you choose to target. The information included in your ads can be displayed as text or images. In-search ads can be an effective way of capturing new viewers that search for content in your category. You can also use these types of ads to capture content from competitors. In-search ads are less interruptive than in-stream video ads, since users are not forced to watch your content if they don’t want to. Discovery Ads (formerly In-Display Ads) – These are thumbnail image ads that generally appear in the upper right hand corner of the search and watch pages. You can specify which pages you want your ad to appear on. It’s possible to show display ads on the YouTube homepage as well, but only if there’s no other ad showing at the top of the page. After that, discovery ads became even more valuable. The ad says “Beginner’s Guide” and it targets people who are viewing similar types of content about SEO and WordPress on YouTube. Users that click on the ad are automatically taken to the Bluehost YouTube page where they’re shown the entire 2-minute video. 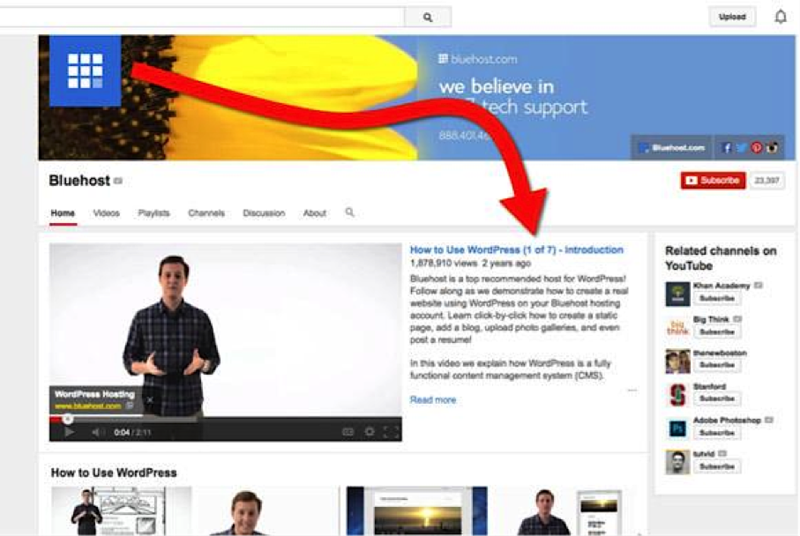 Notice how, below the video, they have another series of short videos that show viewers how to use WordPress. By having additional videos easily accessible, Bluehost makes it easier for potential customers to move down their funnel much faster. Many marketers mistakenly think that customers don’t pay attention to long-form videos. They think that only short videos generate the attention that’s needed to convert prospects into paying customers. But the truth is, if you target customers at the right stage of the buyer’s journey, you can convert them faster by using long-form ads. Notice how the above ad is over an hour long, but it’s displayed on a video that’s also over an hour long. They are designed to keep viewers within the YouTube ecosystem, not link them away to a different page. For this reason, these types of ads are best for marketers who want to increase their YouTube following. Because they’re designed to keep viewers within the YouTube ecosystem, you need to find other ways of linking some viewers back to your landing page. For example, you could add links to your description, use annotations, or optimize your video for SEO. Video ads are a great way to engage people who have no previous experience with your brand. Skippable ads tend to provide a better user experience. They’re more engaging because users are choosing to watch the video, rather than being required to. However, converting users with skippable videos can be difficult, as you need to really grab their attention within the first five seconds. If you choose this option, try to present all your important ideas in the first few seconds and then subtly reveal other interesting information throughout the rest of the video. Using in-search ads can be a powerful way to build trust with users searching for your brand. They’re especially effective if used in conjunction with television advertising, as many consumers search for brands on YouTube after seeing their ads on television. Search ads can also be a good way to connect with users in different stages of the buying process. To do this, identify customers who are searching with keywords that indicate they’re trying to find more information about the products you offer and use this opportunity to present your brand. Each of these ads can have a place in your campaign, but it’s up to you to decide how to best engage with your target customers and how to determine which stage of the buying process they’re in. 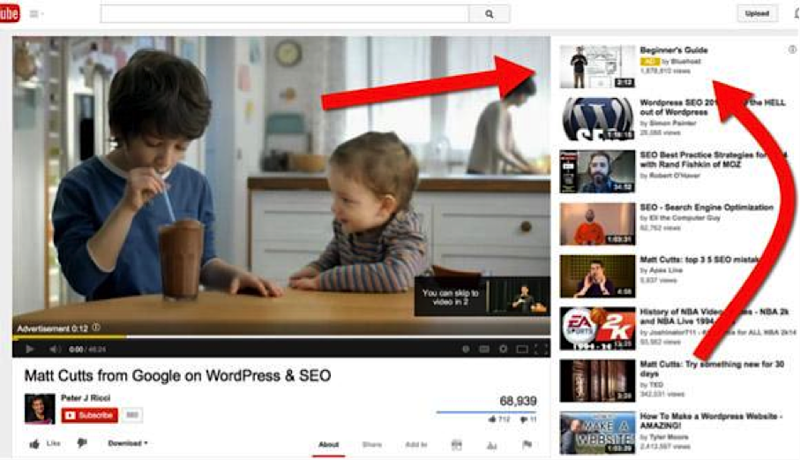 Now you’ll need to select one of the videos that you’ve uploaded to your YouTube channel to display in your ad. If you haven’t created a video specifically for your campaign, make sure that the video you choose reflects the message that you want to convey to your viewers. If you’re choosing from your channel, you’ll also want to check that the length of the video falls within the limits allowed by your ad type. If not, you may need to make some edits to shorten it. When thinking about the best practices to follow on YouTube, it’s important to think about the state of mind your end user is in when they watch your ad. For example, what stage of the buyer’s journey are they in? If they’re searching for quick 2-3 minute videos on how to use some features in WordPress, then chances are they still early in the process. You’ll have to engage them with more educational content before you can sell them. If they’re already watching video sales letters that are over an hour long, then you know that you can probably pitch them your product near the end of your video ad right away. 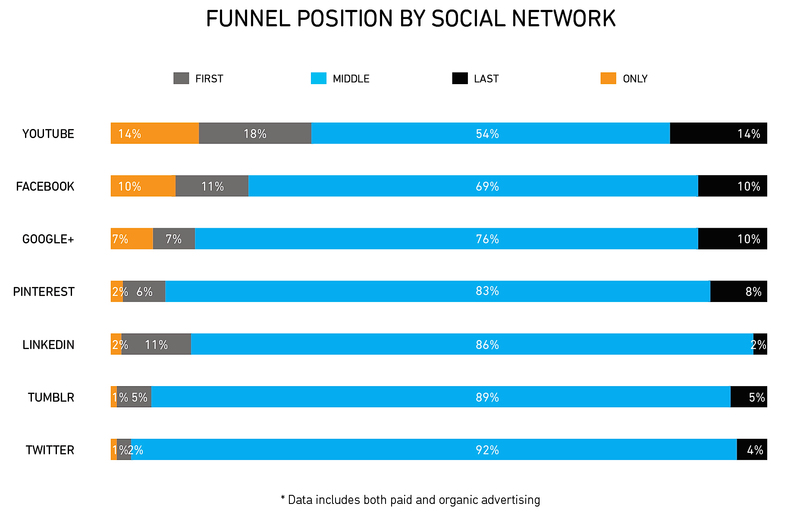 Where do you want your viewers to go after they click your ad? AdWords allows you to direct them to either your YouTube channel or to one of your videos. Linking to your channel may be preferable if you’re trying to engage with a new lead for the first time, as this gives them the opportunity to browse all your videos and get a good understanding of your brand. On the other hand, if you’re targeting users who are ready to convert, linking to videos with a clear call-to-action may be more advantageous. As with every other step of this process, it’s regular testing that’ll reveal whether or not you’ve selected the correct destination for your YouTube ad. Key Takeaway: Your ability to effectively engage with your audience will make or break your YouTube ad campaign. Tailor your ads and videos to your target customers and make sure that they complement your conversion goals. YouTube remains the most popular video sharing site on the Internet—and for good reason. The site has over 1 billion users, which means that you won’t have any difficulty setting your ads to target the people who are most likely to be interested in your products and services. However, succeeding with this marketing method still requires a lot of work. You’ll need to create high-quality videos and invest in both testing and targeting on an ongoing basis to run a successful YouTube campaign.